Ms. Siswani Sari graduated from Bogor Agricultural University (Indonesia), majoring in Marine Science and focusing in Mud Crabs Communities at Mangrove Ecosystem. She worked at the Marine and Fisheries Agency, Sabang Municipality before continuing her studies by doing a Masters in Environmental Management from School of the Environment, Flinders University, South Australia. Her masters thesis was on Disaster Risk Reduction in Banda Aceh, Indonesia. 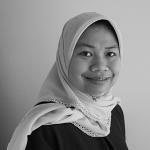 Once back in Indonesia in 2009, Ms. Sari worked at the Sabang Geospatial Data Centre, and in 2010 she started working for the Planning and Development Agency (Bappeda) Sabang Municipality, Aceh, Indonesia. She was awarded a DAAD-Aceh Scholarship for Excellence and an opportunity to pursue a PhD at UNU-EHS and Bonn University in October 2012. She is currently conducting her research Measuring and assessing governmental and non-governmental strategies and approaches to build disaster resilience after a mega-disaster – Case Study: Aceh province, Indonesia after the Indian Ocean Tsunami.